While memory lapses are often considered a common part of growing older, they can often be a sign of something far more serious. Most of us have days where we misplace our keys, forget to stop at the store on the way home, or can’t quite recall someone’s name. However, if this is happening often, especially along with other changes noted below, it’s worth seeing a family doctor as soon as possible. Dementia is not a normal phase of aging, and signs and symptoms should never be ignored. What is dementia, and how common is it? Dementia is a term used to discuss symptoms that are caused by disorders of the brain. Alzheimer’s is a widely known disease that can cause symptoms we would classify as dementia. It is more common than many people realize, though it seems to be gaining increasing recognition in recent years. According to the Alzheimer Society Canada, it affects 564,000 people in Canada, though that number is expected to spike to 937,000 in just 15 short years. They estimate that 1.1 million people are affected by this disease, either directly or indirectly. Watch for odd blanks in memory, especially regarding recent events or daily routine. Especially when they are found in strange locations. A set of keys left in a jacket pocket is not as concerning as a set or keys finally located in the freezer. Watch for difficulty calculating money or counting change when shopping, or mistakes in cooking or baking favorite dishes. Feeling disoriented in a new city or venue is common, but getting lost on the way home from a regular stop is a red flag. You may find your loved one pausing often to find the right word or using the wrong word when speaking or writing. Dementia can cause those suffering to feel confused or frightened, and this often presents as irritation or anger first. Suspicion of change or new people may also be noticed. When someone begins to experience confusion or feel less capable, they may avoid certain tasks or activities. You may notice a change in personal grooming, or your loved one dressed inappropriately for the weather. Early intervention will, at the very least, ensure your loved one stays safe and help you make necessary adjustments to daily life or care. These changes may be gradual at first, but could allow them to keep up daily routines as long as possible. It also is important to explore treatment options – while there is currently no cure, some treatments may prove helpful. It’s worth learning all you can about these early so you can make informed decisions. It’s important to note that other, unrelated, conditions can cause similar symptoms and they may very well be treatable. Last, while it may be a difficult diagnosis to accept, most of us would rather be involved in decisions and plans for care over the long term. Ensure they see a doctor, and find out what you can so your loved one can make their wishes known now for what may lie ahead. What should you do if you or a loved one is experiencing warning signs of dementia? The first thing you should do if you notice these warning signs in a senior parent is get them in to see a family doctor. You may want to go with them or communicate concerns ahead of time if possible. The clearer picture you can give of how your loved one is acting, and especially changes in their behavior or capabilities, the better. 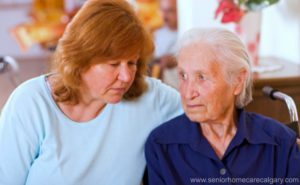 Dementia may create a need for more support or care for a senior parent that you can take on alone. We recommend a visit to a family doctor, but we’re always happy to help offer our support as you take the necessary steps. Have questions or feedback on what you just read? Please don’t hesitate to contact us, we’d love to chat with you.